In a major archaeological development, Archaeological survey of India’s Gujarat circle has finished it’s task to re-establish Vadnagar’s second KirtiToran. One Kirti Toran was already standing in Vadnagar at the place near Sharmishtha lake since 12th century A.D. but another one nearby, was dismantled and grounded in parts before some decades. Who grounded that second KirtiToran was not documented but among local people there is a myth that it was grounded by then ruler of Vadodara state Shri Gayakwad and it was grounded because Sayajirao wanted to relocate it at capital city of his kingdom, Vadodara. But later on when people of Vadnagar protested against this decision, idea of relocation was deserted. Since a long time second KirtiToran was lying in a grounded position in eight different parts. Nobody thought to reestablish it again in a standing position. But when Shri Narendra Modi became chief minister he insisted for that cause. Finaly Archeological survey of India has finished that task after four years of delay. Talking to DeshGujarat, Shivanand Rao, superintendent of Gujarati circle of Archeological survey of India said that Kirti Torans are early 12th century masterpieces. Second Kirti Toran has been made in a standing position again by using iron roads implanted to join the parts. Upper part of lintel is partially new built one. 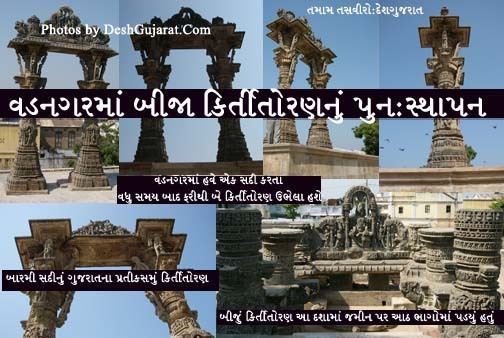 Figures/photos of Kirti Toran are used as a symbol of Gujarat in government’s literatures since 1960, when Gujarat became a separate state.